First of all, don’t forget our poll HERE, at least take a look at the result (which is my real purpose: To let you know the current sentiments). It’s very interesting because since we had the poll, never was once bulls were the majority except this time (so far), although not much margin. The seasonality around the Thanksgiving week is very bullish, especially the Wednesday, Dow up 8 out of 9 since 2002. So the general trading strategy is to buy Monday or Tuesday weakness then sell into Friday strength. I’ve noticed that such a routine hasn’t preformed well since the year 2006, so might not a bad idea to sell at least half into Wednesday’s strength. Be careful not to hold until the next Monday (11/28) because Dow down 7 out of 9 since 2002 on the day. For more details about the Thanksgiving seasonality, please refer HERE (since the Seasonality topic can be repeated every year, so it’s not part of my daily Mark Outlook anymore, instead I’d gradually add those topics under the “Seasonality” menu), and also you can find similar tips at the Trader’s Calendar on the top right corner of the site’s front page. For the short-term, I expect a lower close ahead, at least lower low is more likely. For the intermediate-term, although officially the downtrend has yet confirmed, I believe the game is over for bulls. There’re 47% chances a green week the next week and that’s it, after that we’d see multiple weeks selling (80% chances). I’ll discuss this in the intermediate-term session later. Why do I expect a lower close or at least lower low ahead? I’ve mentioned the chart below in the 11/17 Market Outlook that an official intermediate-term downtrend starts only when $120 is broken. From the Pennant pattern formed on the Friday, I believe chances are high that $120 wouldn’t hold. Never should a strong uptrend have 3 consecutive down days. Unfortunately, Friday is the SPX’s 3rd consecutive down day. From the chart below, clearly chances are high there’d be a lower close ahead. Red OE week means 17 out of 21 (81%) chances at least a lower low the next week. In the intermediate-term session below I’d mention that 12 out of 15 (80%) chances we’d see a lower low the next week. The last but not the least, don’t forget what I mentioned in the 11/17 Market Outlook that chances of a lower low ahead after a Major Distribution Day and a Non-Stop model sell signal are pretty high. NYSI weekly STO sell signal is very reliable when the long-term signal is also on the sell side. We’ve had 2 consecutive exceptions (also the only 2 exceptions), I don’t believe we’d see the 3rd exception, because the 3rd time is the charm. 7 out of 15 (47%) chances we’d see a green week the next week. 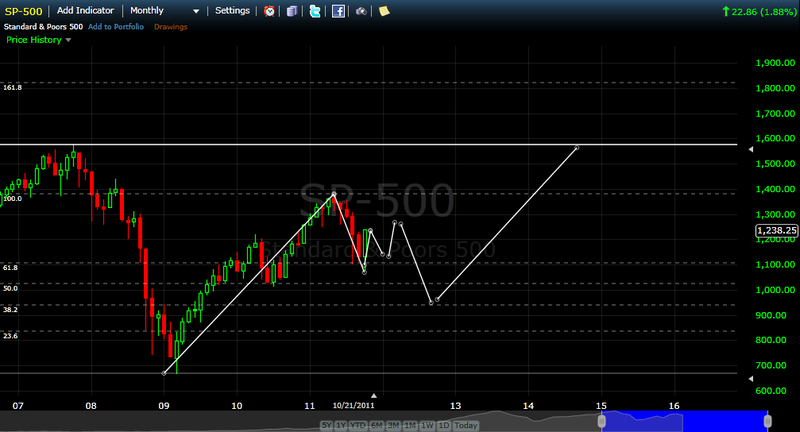 Only 3 out of 15 (20%) chances the SPX would rally for 2 more weeks from here. Also only 3 out of 15 (20%) chances the SPX would rally the next week without forming a lower low first, i.e. gap up Monday and never turns back. TED Spread had dropped below its 2010 lows. Usually the monthly BB bottom is the target which now happens to be around the June 2010 lows. Intermediate 3 of 5 SELL 5 of 5 NEUTRAL Cobra Impulse in BUY mode; Non-Stop in SELL mode. 66 Comments on "11/18/2011 Market Outlook (SPX Target 1010ish)"
So is it safe to initiate short positions yet? There’ll be a Santa Rally. Yes, I believe Santa Rally too. Neither shorts nor longs got a chance to load up properly. Low volume indecision rotations might continue for some time to frustrate both sides. I still believe Santa Rally. If traditional P&F shows “sell” the market is heading south or sideways – well, that’s my belief. Cobra, by Santa Rally do you mean – a rally that starts around 12/22 and goes thru 1/2 or something else? Thanks! Last 5 days of 2011 and the first 2 days of 2012.
cobra – regarding the red OE week stat, the 4 times where was a bounce, we were coming off of multiple down weeks. Currently we are down only one week. After getting started with a bang, complete with a rare Zweig Breadth Thrust signal, that put one of the biggest monthly candles ever on the charts in what is a seasonally bearish month, a total reversal would leave one hell of a bull trap on the charts, and would be EXACTLY WHAT ONE WOULD EXPECT from a healthy, mature bear market, but without really realizing it at the time (hence the bull trap). Last week’s EOD nasty sell-offs on Tuesday and Wednesday, leaving obvious intraday bull traps in place, may serve as fractal warning shots. That’s simplified of course. The bullish setup was (is?) huge and supported by many more indicators, sentiment, cycle projections, etc., and IF we get a failure, I’m thinking expectations for something just as huge to the downside would be reasonable. I’m surprised no one I’ve read this weekend has even commented on the rare occurrence in the options market. The total put/call ratio came in at 0.89 and CPCE came in at 0.90. This has to be the first time I’ve EVER seen this occur in many years (CPC < CPCE). It may have, but this was a very very rare event. Yet no one has even researched what it meant for the short term and intermediate term. I think there is more downside but this particular metric would seem to confirm a bullish bias (dip buying mentality) into the end of the year since equity option traders are rarely right about the big picture. Sentimentrader did a report about CPCE > CPC and accordingly I did my own test, I didn’t see any bearish short-term edge as Sentimentrader said, so that’s why I didn’t say anything here. Unlike text book said, usually CPCE leads, it’s not a contrary indicator, and this is actually what my Non-Stop model based on. Also my “famous” CPCE trend line for detecting the top also based on CPCE leads the market and so my VIX leads theory. True, I’d say CPCE being high indicates a little bearish bias for the short term. However, it is pretty obvious from all backtests that when CPCE gets above 0.90 the market is closer to a bottom than a top. When people start buying lots of puts, they are always too late. This part, I agree, everything has a limit. The most difficult thing is no one knows where the limit is. Put call ratio really strange those days, I don’t recall I saw them act like nowadays. using the Currencies to Nudge? (and/or SHOVE?) the Markets in whichever direction is Goal-Suitable. LOOK, it’s a Bull-Market!!! NO, it’s a Bear-Market!!! Closely-Monitoring/Watching the: CPCs, SCANs, EURO/FXE, USD/UUP, the $SPX’s 10/13/15,30, 60-Minute MACDs and corresponding 5,8,20-Period-Moving-Averages for Additional-Clues. Cobra: I really enjoy the overlay of spx and 1/ted. Simply amazing! Unless the two start to decouple, your predicted target is not overly expected imo. – Next Wednesday is the deadline for US Senate comitee to decide about some budget cuts. It seems that there will be no agreement. – According Yahoo (news were posted several weekas ago), Fitch already decided to downgrade US rating. However they are still waiting for the obvious, no agreement in order to decide for it. Did you notice the extreme divergence between cpci (they’re bullish) and cpce (they’re bearish) on Friday? Plot CPCi:CPCE and you’ll see what I mean. This must at least short term bullish. Also wondering if you have a Rydex update. hasn’t failed us yet, so let’s try a trick that worked for us recently. We’re going to steal data from 2008 and add it to our current data. Santa Rally fans (such as Cobra) should closely inspect this chart: support 1205/1210 is more important than I previously thought. A break under 1205/1210 on a closing basis suggests further weakness. Santa Rally is simply because of holiday volume too thin, nobody sells into thin volume as it’d cost too much, so most likely it’d rise. If INDU leads, as you say Cobra, the relative strength late last week vs. the SPX can only be interpreted as being bullish for the market. any top. Either Oct 20 low (1,197) or Oct 17 low (1,192) will be revisited on Monday or Tuesday latest. Could it be a positive divergence by open tomorrow? Just a wild guess. Doesn’t matter, if we lose 1190-1200 that’s going to be ugly. Watch price and trade accordingly. Well it kinda does because I will use rally as opportunity to load shorts. As of last Thursday I unloaded my shorts and now totally in cash and in wait-n-see mode. Hi Cobra, I feel I learn more about money markets from you then I do from my finance department. Many thanks. I was curious if you could tell me the stockcharts overlays/parameters you use for your long term trading signals you presented this weekend. Thanks again. MACD( 13, 34, 1), it’s basically to watch weekly EMA13 and EMA34 crossover. Lastly, this table from Schaeffer’s research is interesting as Monday’s close has predicted the direction of the weekly close since 2000. I like the idea of buying Monday and selling Wednesday… though in 2008 – it was sell Friday! as we collapsed 8% on the following Monday.